Dunajec Castle, also known as Niedzica Castle, sits at the very southern edge of Poland near the foothills of the Carpathians. 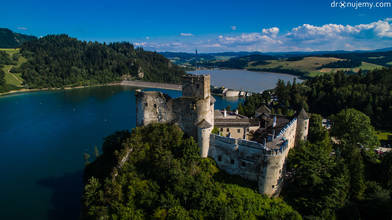 Built in the 14th century, it is one of the most well known castles in the country. Ownership of the castle changed several times over the centuries between Polish and Hungarian owners. In this video, contributor Dronujemy flies a DJI Phantom over the castle, giving us a bird's eye view of this amazing structure. The castle lies in the province of Lesser Poland (Małopolska).